Harrisburg, PA – Pennsylvania has been selected as the first state to participate in a groundbreaking initiative from Bloomberg Philanthropies designed to strengthen state and local opioid prevention and treatment efforts. Governor Tom Wolf accepted a $10 million grant this morning from Michael Bloomberg—founder of Bloomberg Philanthropies and World Health Organization (WHO) Global Ambassador for Noncommunicable Diseases—at the inaugural Bloomberg American Health Summit in Washington, D.C. Governor Wolf was a featured speaker at the event, describing his administration’s approach to reduce the number of Pennsylvanians addicted to opioids. Pennsylvania was selected as the first state for this partnership due to the toll the epidemic has taken and the work it has already done to fight the opioid crisis. Following the summit, Gov. Wolf and Michael Bloomberg are in Philadelphia to visit the Bridge Way School and Thomas Jefferson University Maternal Addiction Treatment Education and Research to see the unique opioid use disorder treatment programs implemented by these facilities. Bloomberg Philanthropies will work with the Wolf Administration over a three-year period. Targeted funding areas will include staffing, technical assistance, and data collection. 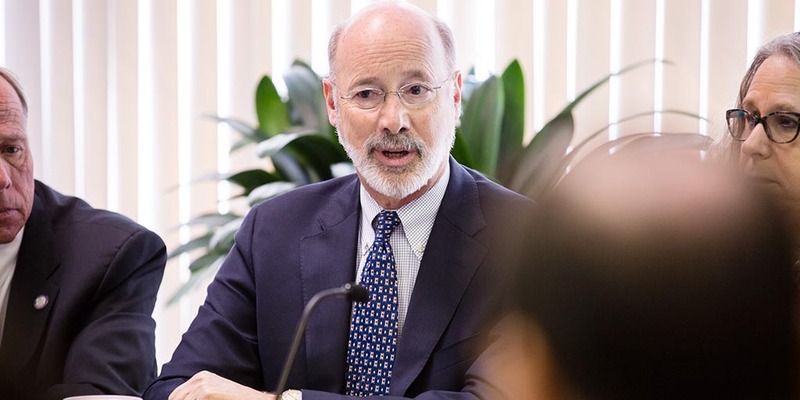 Since Governor Wolf first signed a heroin and opioid disaster declaration in January, 16 state agencies have been charged with fighting the opioid epidemic and have made significant progress to help individuals and families dealing with this crisis. Recent accomplishments include waiving birth certificate fees for individuals seeking treatment, using federal Medicaid funding in treatment facilities to provide medically necessary treatment to more than 125,000 individuals, and providing career services to people who have been impacted by the opioid epidemic and plan to return to work. While in Philadelphia, Gov. Wolf and Michael Bloomberg are speaking with individuals and families affected by opioid use disorder who are participating in unique, state-supported recovery programs. Gov. Wolf and Michael Bloomberg are touring the Bridge Way School, the city’s first school for students in recovery, where they will meet with students and staff to learn about the unique program. At the school, high school students in recovery develop and nurture the tools and strategies to maintain sobriety while holding themselves and their classmates accountable as members of a sober learning community. Later they are meeting with participants in the Thomas Jefferson University Maternal Addiction Treatment Education and Research (MATER) Program and talking with treatment experts and Dr. Stephen K. Klasko, president and CEO of Thomas Jefferson University and Jefferson Health, about treatment for opioid use. Mothers at the Thomas Jefferson University MATER Program participate in a trauma-informed, mindfulness-based parenting intervention while also in medication-assisted treatment for opioid use disorder. Researchers at MATER are also studying the connections between behavior and pharmacological interventions with reductions in cigarette smoking, benzodiazepine abuse and opioid use disorder. MATER is a designated Pennsylvania Center of Excellence for the treatment of substance use disorder.